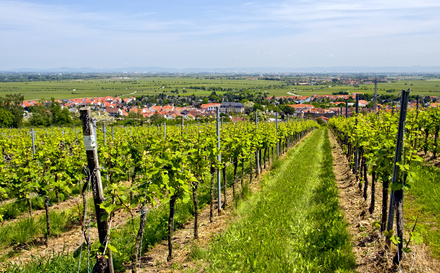 The vineyards and the Palatinate Forest is the largest continuous forest area in Germany and offers many exciting opportunities for hiking trips. The forest and wine trails wind through the most stunning spots in the region and provide lots of relaxing and thrilling hikes, with many restored castle ruins and Roman excavations to visit along the way. Comfortable inns offer plenty of opportunities for refreshment and good company, and we will be happy to provide the relevant maps and help you choose some interesting excursions and tours. Wine trails Spielberg-Herrenberg (c. 4.5 km), Hochmeß (5 km) and Honigsäckel (6.5 km): routes through the vineyards around Bad Dürkheim with fantastic panoramic views, including the Roman wine press at Ungstein. Nature study trail (c. 5 km) on the history, geology, wood biology and the flora and fauna of the woods around the Celtic ringwall (the Heidenmauer). Bird trail in Bad Dürkheim - Hardenburg (c. 3.5 km) with pictures of our familiar feathered friends including robins, bullfinches, tawny owls and many more. Study charts and information boards bring you closer to the world of birds.